An Arabic letter handwritten by Father Khouri Bronobabas Elia alAntaki on March 5, 1911. It confirms the birthdate of George son of Michael Saliba on June 15, 1895, and baptism on July 5. A certificate in Turkish. ID certificate/record, year of birth 1895. An Arabic letter handwritten by Father Khouri Elias alHadshity on May 19, 1912. 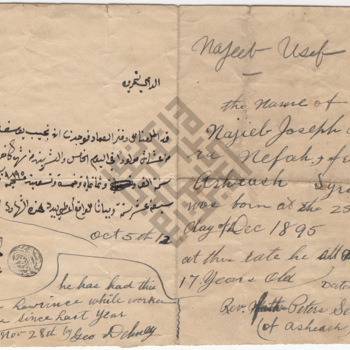 It confirms the baptism of Nazeera daughter of Nekoula Nema Hatem on April 29, 1895. An Arabic letter handwritten by Father Khouri Hannah Bekfaya on October 2, 1913. It confirms the birthdate of Fareeda Ameen Mahiouf on November 16, 1895, age (18). An Arabic letter handwritten by (name not clear) on June 26, 1912. It confirms the birthdate of Najeeb son of Elian Mansour on November 17, 1895.